“Kindness and Truth shall meet; Justice and Peace shall kiss. One of the Early Church Fathers, Tertullian [155-240AD], said this about dealing with truth—“The first response to truth is anger.” That seems to be the case. To speak the “Truths of Life” is now called “hate speech”. Today, we rarely, if ever, find revealed Truth on TV, in social media, in music, and in movies. We are fed a false reality and a distortion of natural and supernatural Truths. Many students have been indoctrinated in schools—from K-12 through colleges and universities—by ideologues, not teachers. Ignorance of the Truth can destroy your heart, mind and soul … that should scare you! I dedicate this book to you, and to all of my family, friends, New Agers, Gen-Xers and Millennials who have never known the essential “Truths of Life”. Please, embrace this book as a loving message and a mysterious enticement to enter into the glorious realm of the Angels and the Saints. Discover those who have learned, loved, and lived these “Truths of Life”! Together, we will seek to find that wondrous place that God has prepared for each one of us—if we choose to accept His Curious Invitation. There have always been doubters and disbelievers who cannot get their heads around what has been known to be true for eons. I get that. I always believed in God; however, I had a very hard time trying to figure out why an otherworldly Supreme Being—the Creator who created everything out of nothing—would be remotely interested in an insignificant creature like me? The concept of a “caring God” was a curiosity to me. After many years on planet Earth, eventually I felt a calling—an invitation of sorts. I began to open my heart and expand my horizons. The more I searched, the more I found. The more I found, the more I wanted to know! The more I knew, the more I wanted to share! Once I began to share, I discovered that I also had to defend what I had found. Now, I would like to pay forward that Curious Invitation, like the one I received many years ago, to you. 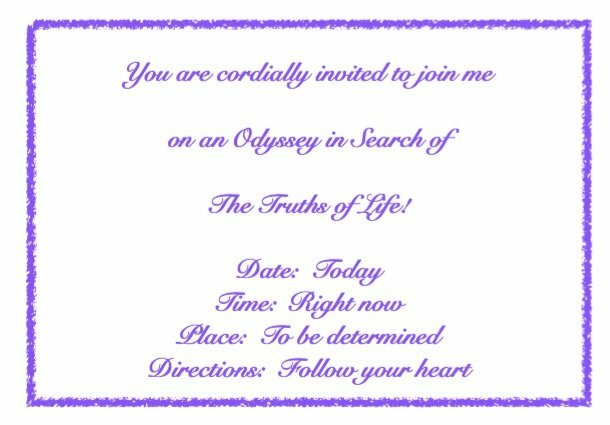 If you accept this invitation, we will fasten our seat belts, recharge our batteries, silence our smart phones and embark on an exciting journey through time and space that will impact your life—I promise! You will discover new wonders, meet new friends, and maybe change your perspective on what it means to love and be loved. The funny thing is that much of what we will discuss and explore has been known for thousands of years. Look at the vast cosmos—the billions of stars—and think about this: One day they will all be gone, while your soul will live on forever and ever. If you seek the Truth with love in your heart, along the way you might even touch the Hand of God! Did you know that before Jesus was scourged, mocked and crucified, Pontius Pilate asked Him, “What is truth?” How ironic. Pilate was looking directly at Truth. Truth is not something, it is Someone. That Someone is Jesus of Nazareth, the Son of God, the Son of Mary, the King of the Jews, the Savior of all who believe in Him. Jesus has told us, “I am The Way, The Truth and The Life.” It is my honest intention to introduce you to the “Truths of Life” that Jesus taught. I promise to do my best to guide you, and to help you understand His Truth. But, how can I speak for the One who claimed to be God? I am neither a scholar, nor a theologian. My only qualification is that I am a baptized Christian; however, as such I am given a charge by Jesus to “Go forth and spread the Good News.” The Good News is not something that I made up, or that anybody made up. The Good News is The Word of God. Jesus made the trek from Heaven to Earth with a message of Love for Mankind. He came here for YOU. Do you know WHY He did that? The answer to that curiosity is the purpose of this book; but, nothing I can, or will say is new. Jesus’ teachings have withstood the test of time. Regarding our personal beliefs, all religions cannot be true if they contradict one another. There can be only one Truth. In seeking Truth, we should never accept relativistic morality, theology, or philosophy because Truth cannot be relative. Either something is true, or it is not. Being a guide is a serious responsibility. It is much like being a parent—which, if you ask me, is the most challenging vocation on Earth. So, if I misguide or mislead you, I am truly sorry, and I pray that God will have mercy on my soul. My credentials leave a lot to be desired, that’s for sure; but, I have this calling to share a few ideas and, hopefully, to clarify some of the common misunderstandings that have caused so much disagreement, delusion, and deception among Christians and non-Christians, and Catholics and Protestants. Please don’t think I am being judgmental. I am not judging—I am merely sharing and defending. No guide would be worth a dime if he failed to protect those entrusted to his care, and did not employ the system designed to maximize their chances of survival. Although the system that I am defending will keep us safe, it may push buttons and cause some people to hurl hateful, false accusations my way; such as I must be a bigot, a homophobe, an Islamophobe, a woman hater, narrow minded, a religious zealot, a right wing fanatic, old fashioned, out of touch, mean-spirited, egotistical, and worst of all, politically incorrect! Those who really know me will say that’s not me at all! [That is, except for the “politically incorrect” label emblazoned across my forehead and in my heart.] Being PC is not compatible with Truth. That might cause you to tear up your invitation, and to remain firmly planted where you are. However, if you are feeling curious, adventurous, or bold, you may want to find out why being PC is dangerous, short sighted, and nothing more than political mind-control. PC = Personality Control. Obviously, it would be fantastic if everyone could “Cø∑x!$†” in some man-made utopia; but, how on Earth can we convince others not to attack, insult, hate, hurt or kill us? Our only utopian hope is otherworldly; it is God-centered, and will be found in the life to come—for those who seek it. When I stand before God, I hope He will judge me as a teacher and defender of the Faith—namely, the Truths of Life that were taught by His only Son, Jesus Christ, and handed down through the ages by His Apostles and His Holy Church. Jesus knew what would happen to those who would follow Him and defend Him. Jesus nailed it [pun intended] when He said, “If people hate you, remember that they hated Me first.” (John 15:18) Take a look around. Was He right? You bet your life He was! It is Politically Correct to defy anything Jesus, and Christianity, stands for. St. John Vianney, the Patron Saint of all Priests once said, “No friend would send another friend to hell.” That means that if you love someone, and really care for them, you will extend a guiding hand to help them avoid the consequences of their actions, or inactions—especially when the consequences are eternal! In other words, don’t just be nice. Instead, be kind and caring, and lovingly point out the error of their ways. Hell is REAL! Hell is forever! Hell is Darkness and is totally devoid of LOVE! Heaven is REAL and forever! Heaven is Light! Pure LOVE abounds in Heaven! Jesus taught us about Satan, fallen angels, evil spirits, and Hell when He walked upon the Earth, and came to show us The Way. Jesus confronted evil spirits head on. He drove out demons, challenged Satan, chastised the Pharisees and the money changers in the Temple. He taught us how to deal with evil. Jesus leads the Way to Heaven, and warns of the hazardous highway to Hell. What an Awesome Guide! If you are non-Christian, most of this might be new to you. I will do my best to help you understand the essentials of Christianity, specifically, the Catholic Church—the GPS, and moral compass that Jesus gave us to follow. To all of my Protestant brethren, please don’t let my words upset you. Most likely everything you have been taught about the Catholic Church, and Catholicism in general, you learned from non-Catholic sources. Perhaps you heard things from well-meaning pastors or writers who, in the course of their studies under the tutelage of non-Catholic instructors, were given incorrect or skewed information. Or, maybe you heard it from former Catholics who never really understood the Catholic Church, or their Catholic Faith either. Some of you may have even learned to hate, or distrust the Church due to scandals, or false and prejudicial teachings of anti-Catholic Fundamentalists who will say anything to make you hate her even more. But, the Truth of Jesus is not subjective. It cannot be changed. It is Truth. Some say that, “All religions are the same.”; or, “All religions have the same goal and pray to the same God.”; or, “All religious people are climbing the same mountain to find God.” These seem like intelligent precepts; but, if they were true, then why are there so many disagreements with one another—[Protestants and Catholics]; or worse, why are they often diametrically opposed to one another? [Islam—“Allah is our Master” vs. Christianity—“God is our Father”] Jesus came to Earth to reveal the God of Abraham, Isaac, and Jacob to us—Jews and Gentiles. If Jesus gave us a true religion, then we must consider what He had to say about The Way to live, and how to praise and worship God. If He was a fraud, then Christians should climb down from that holy mountain. However, if your heart tells you that Jesus Christ is God … follow Him! I, too, am growing and trying to follow the path that leads me home. I surely don’t know everything there is to know, and I am certainly no saint; but, I have a grasp of the basics, have some interesting insights and a passion to share them. At last, we are ready to begin our journey! Kindly hang in with me as I present WHO Jesus is, WHAT His Church really is, and WHY it is vitally important to know that Jesus gave us a Church. His Church is often called “Holy Mother Church”. Sometimes we may get angry with our mothers. Seeking independence, some may even run away from home. However, a loving Mother will always love her lost children, and she will always keep a light shining for them. This book is an invitation to come home, and a light to safely lead you. As the invitation says, “Follow your heart” … Follow your Guiding Light. As we forge onward, please consider each new concept with an open mind. Then, take it or leave it, accept or deny it, drag it into the trash bin, or “un-friend” me if it makes you feel better. Many of these points might challenge you, and they should; but, you may find them to be truthful, meaningful and helpful. You might even discover a lifeline that keeps you from falling into an eternal abyss. Ideally, you will have an epiphany that changes everything! … It’s all up to you. 1: Are you curious and yearning to journey onward and discover these Truths of Life? 2: Do you know that Jesus has always loved you … and He always will? 3: Do you get uncomfortable when people mention the name of Jesus in public? 4: Have you ever shared your thoughts and beliefs with your family and friends? 5: Have you ever stopped a child from running into traffic, or touching a hot stove? 6: Do you know we are all children of God, and are being invited to come home, safely? 8: Can you find Truth without Love?